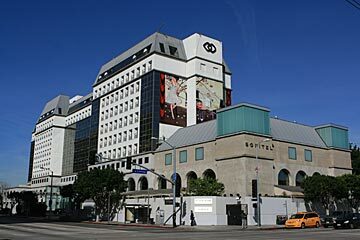 Beverly Hilton ($$$$) 9876 Wilshire Blvd, Beverly Hills. The Beverly Hilton is where you can walk to Rodeo Drive and Century City Star gaze in Hollywood. visit the Getty or LA County Museum of Art and picture postcard beaches are minutes away. LAX and Burbank/Bob Hope Airport are also minutes away. Known for the world's most famous zip code - 90210. it's a favorite retreat for the stars or for those who appreciate being treated like one. 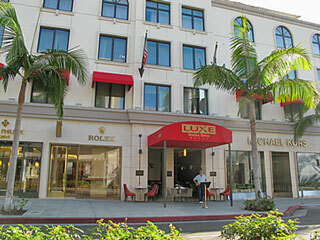 Avalon Hotel ($$$) 9400 West Olympic Blvd, Beverly Hills. The hotel where Marilyn Monroe once lived. Recreated under the direction of Kelly Wearstler Interior Design and Koning Eizenberg Architecture, with landscape architecture by Mia Lehrer Associates and imaging and communications contributions of ReVerb, Avalon is distinguished by its novel physical space - a triangle of mid-century architecture - and its attentive sensitivity to details, both in design and guest services. The hotel is minutes to fine dining, shopping and entertainment. Luxury Hotels in Beverly Hills and Nearby - Resorts and luxury hotels that are located in or near Beverly Hills and Century City: L'Ermitage, Four Seasons, The Peninsula, Beverly Hills Hotel and Sunset Marquis Hotel in West Hollywood. The list only includes hotels that are rated with 4.5 stars or 5 stars These are some of the finest accommodations in the Beverly Hills area. Hotels near Beverly Center Shopping Mall - other nearby attractions are Restaurant Row, The Grove / Studios), Miracle Mile (10 minutes), Beverly Hills Business Triangle /Rodeo Drive (10 minutes), West Hollywood (10 minutes), Hollywood (15-20 minutes), Universal Studios (30 minutes). SLS Hotel at Beverly Hills ($$$$) 465 S. La Cienega Blvd, Los Angeles. Guest rooms are elegantly decorated and offer special amenities such as bedside control of in-room lighting, temperature and stereo. The hotel's central location, on Restaurant Row, makes it a perfect choice for both business & leisure travelers. The Orlando ($$$) 8384 West Third Street, Los Angeles. 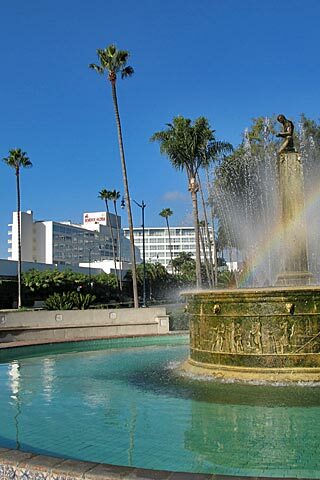 Located between Beverly Center mall and Farmers Market, the hotel offers more affordable accommodations than nearby hotels, in a great location. (The rates here are almost $100/night less than the nearby Sofitel).